Kwame Onwuachi might have called his memoir “Making It.” After all, he’s the executive chef at Kith and Kin, an elite restaurant in Washington, D.C., where the “Kith breakfast”—eggs, bacon or sausage, toast and coffee—goes for $24. Gumbo is $24, and an 18-ounce dry aged ribeye is $60. Before he opened Kith and Kin, Onwuachi trained at the Culinary Institute of America. Later, he worked at Eleven Madison Park and at Thomas Keller’s flagship New York restaurant, Per Se. Onwuachi describes his experience at Per Se in a chapter called “Blood on the Eggshells,” with heaps of praise for Keller and little if any praise for Keller’s underlings who often come across as nasty, though occasionally kitchen camaraderie rises to the surface. In his memoir, which he co-authored with Joshua David Stein— formerly a food columnist for The Village Voice—Onwuachi describes his climb to the top of the exalted world of celebrated chefs, though it’s not a steady climb. At times he falls down, picks himself up, and begins to climb all over again, with grit. “Everyone is famous to themselves,” he writes in the opening chapter, which gives rise to great expectations. Notes from a Young Black Chef—which includes more than a dozen recipes for dishes such as “hot chicken and waffles” and “steak and eggs”—offers a compelling narrative of an ambitious and at times arrogant young man from the Bronx who joined a gang, sold drugs, inevitably landed into trouble, and then turned his life around at about the same time that Barack Obama was elected president. Indeed, the unreality of Obama ‘s victory at the polls clashed with the unreality of his own life as a petty criminal who acquiesced to peer pressure and threw away the promise of an academic career. The harder they come the harder they fall. Onwuachi came on hard and fell hard. The reader sees it coming. The author doesn’t. He’s caught up in the illusion of his own greatness and a belief in his infallibility and doesn’t see the pitfalls around him or the flaws inside. If Onwuachi’s memoir is a story of making it, it’s also an African American version of Pilgrim’s Progress in which the black protagonist occasionally has a “double consciousness,” as W. E. B. Du Bois called it in The Souls of Black Folk. For Du Bois, African Americans had the habit of looking at themselves through the lens of a racist white society. They measured themselves by the standards of a nation that looked at them with contempt. Onwuachi’s Nigerian grandfather, who appears briefly in this book, would have understood. “He was a leading academic voice in the Pan-African movement, publishing books on black ideology,” Onwuachi explains. The grandson absorbed some of his grandfather’s perspectives on race and on blackness. He shares his first name with Kwame Nkrumah, an advocate of Pan-Africanism and the first prime minister and president of Ghana, formerly the Gold Coast and a British colony. Onwuachi also has a kind of false consciousness. He wasn’t as adept at sliding as he thought he was, and he rarely if ever become an “invisible” man. Now, in the pages of Notes from a Young Black Chef, Onwuachi is more visible than he has ever been, even when he worked at Keller’s Per Se, and later when he was the executive chef at Bijou, the elite Washington, D.C., restaurant that went belly up after a brief run. Bad reviews and high prices doomed Bijou. The tasting menu was $185. 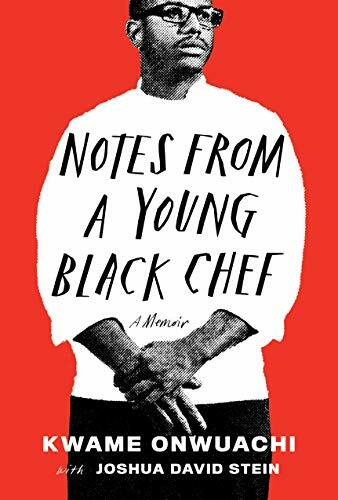 Notes from a Young Black Chef is a compelling memoir when the author describes his nurturing relationship with his mother and his confrontations with a brutal father who abused him verbally and beat him physically. The story of Onwuachi’s climb up, with its attendant pitfalls, is masterful. The closer to the top, the more the story falters. Readers might linger over the first half of this book, turn those pages slowly and savor the spicy stew that the author serves. And by all means study the recipes. Indeed, take this book into the kitchen, follow the directions and start to cook. The recipes are a real bonus. At the end of his book, Onwuachi says that he especially wants to see brown and black faces in his Washington, D.C., restaurant, and that he also wants them to look at the food in front of them and see a reflection of their own heritage and culture. That’s a worthy goal. But it seems unlikely that he’ll cook the dishes “that he grew to love” when he lived in Nigeria during his youth: corned beef sandwiches, canned sardines, Scotch eggs, and minced-meat pieces. That kind of food might be tasty, but it’s too funky and too down-home for a restaurant like Kith and Kin, which seems overpriced and overblown and not the kind of place that might feed the bellies and nurture the souls of black folk.